Dimensions 0 by 5.50 by 8.37 in. 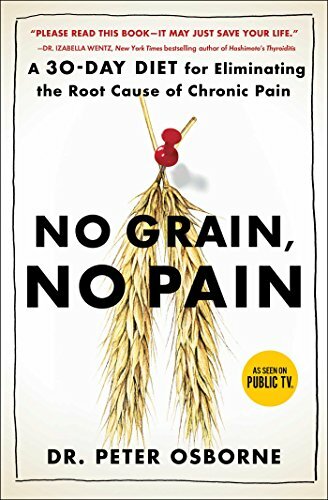 Amazon.com description: Product Description: âA must-read book for anyone suffering from chronic painâ (Sara Gottfried, MD), No Grain, No Pain demonstrates the proven link between a gluten-heavy diet and chronic pain and discomfortâand offers a groundbreaking, 30-day, grain-free diet to help you heal yourself from the inside out. More than 100 million Americans suffer from chronic pain, according to an Institute of Medicine report released in 2011. For many, chronic pain is part of an autoimmune disease, but all too often doctors turn to the same solution: painkilling drugs. But all of this medication simply isnât helping, and as Dr. Peter Osborne, the leading authority on gluten sensitivity and food allergies has found, the real solution often lies in what you eat. In No Grain, No Pain, Dr. Osborne shows how grains wreak havoc on the body by causing tissue inflammation, creating vitamin and mineral deficiencies, and triggering an autoimmune response that causes the body to attack itself. But he also offers practical steps to find relief. Using his drug-free, easy-to-implement plan, you will be able to eliminate all sources of gluten and gluten-like substances, experience significant improvement in fifteen days, and eliminate pain within thirty days. The first book to identify dietâspecifically, grainâas a leading cause of chronic suffering, No Grain, No Pain provides you with the knowledge you need to improve your health. Based on extensive research and examples culled from thousands of his satisfied patients, Dr. Osborne recommends changing your diet to achieve the relief that millions of Americans have been seeking once and for all, leading to a healthier, happier life.